Abdülhamid II His Imperial Majesty, Sultan of the Ottoman Empire and Caliph of Islam (September 21, 1842 – February 10, 1918) was the thirty-fourth sultan of the Ottoman Empire. He oversaw a period of decline in the power and extent of the Empire, ruling from August 31, 1876 until he was deposed on April 27, 1909. Abdülhamid II was the last Ottoman Sultan to rule with absolute power. He saw the loss of the Balkans and of Cyprus, amassed crippling debts and moved the Empire into what proved to be a disastrous alliance with Germany. The Empire ended with the end of World War I, when its provinces were distributed among the victors as League of Nations mandates. Known to some as the Ulu Hakan ("Divine Khan"), he is better known in the West as "The Red Sultan," "Abdul the Damned" or "The Great Assassin" for the massacres of Ottoman Armenians which occurred throughout his tenure. His deposition following the Young Turk Revolution was hailed by most Ottoman citizens, who welcomed the return to constitutional rule. In 1918, at the time of his death he was considered to be the richest man in the world. Constitutional reform was too late, however, to save the empire. Throughout the vast territory governed from Istanbul, local and regional freedom movements were developing and although Abdülhamid stressed his role as Caliph in an effort to attract trans-racial Muslim loyalty, this tactic did not succeed. In many respects, the great powers were simply jealous of the empire and wanted to see its demise. Abdul Hamid II's stewardship of his power was bad enough to confirm the European's ideas about a decaying, decadent imperial project. A wiser ruler may have stemmed the tide of decay and assured a different future for the empire. Only two more Sultans sat on the throne, his successor, Mehmed V who died a few months before the end of the war and Mehmed VI who was a mere figurehead as the empire collapsed around him. Abdülhamid II was the son of Sultan Abdülmecid and one of his many wives, the Circassian Tirimüjgan (Virjin) Sultan. He was a skilled carpenter and personally crafted most of his own furniture, which can be seen today at the Yıldız Palace and Beylerbeyi Palace in Istanbul. Abdülhamid II was also interested in opera and personally wrote the first-ever Turkish translations of many opera classics. He also composed several opera pieces for the Mızıka-ı Hümayun which he established, and hosted the famous performers of Europe at the Opera House of Yıldız Palace which was recently restored and featured in the film Harem Suare (1999) of the Turkish-Italian director Ferzan Özpetek, which begins with the scene of Abdülhamid II watching a performance. He was also a good wrestler and a 'patron saint' of the wrestlers. He organized wrestling tournaments in the empire and selected wrestlers were invited to the palace. Abdülhamid personally tried the sportsmen and good ones remained in the palace. Unlike many other Ottoman sultans, Abdülhamid II traveled to distant countries. Nine years before he took the throne, he accompanied his uncle Sultan Abdülaziz on his visit to Austria, France and England in 1867. He succeeded to the throne following the deposition of his brother Murad on August 31 1876. He himself was deposed in favor of his brother Mehmed in 1909. His brother had no real powers and continued as a figurehead only. At his accession, some commentators were impressed by the fact that he rode practically unattended to the Eyüp Sultan Mosque where he was given the sword of Osman. Most people expected Abdülhamid II to have liberal ideas, and some conservatives were inclined to regard him with suspicion as a dangerous reformer. He took over default in the public funds, and an empty treasury. He did not plan and express any goal in his accession speech, however he worked with the Young Ottomans to realize some form of constitutional arrangements. This new form in its theoretical space could help to realize a liberal transition with Islamic arguments, which could balance the Tanzimat's imitation of western norms. The political structure of western norms did not work with the centuries old Ottoman political culture, even if the pressure from the Western world was enormous to adapt western ways of political decision making the disharmony in the empire did prove a different view, at least in the eyes of the Sultan. On December 23, 1876, under the shadow of the 1875 insurrection in Bosnia and Herzegovina, the war with Serbia and Montenegro and the feeling aroused throughout Europe by the cruelty used in stamping out the Bulgarian rebellion, he declared the constitution and its parliament. The international conference which met at Istanbul towards the end of 1876 was surprised by the promulgation of a constitution, but European powers at the conference rejected the constitution as a significant change; they preferred the 1856 constitution, the Hatt-ı Hümayun and 1839 Hatt-ı Şerif of Gülhane, but questioned whether there was need for a parliament to act as an official voice of the people. In any event, like many other would-be reforms of the Ottoman Empire change proved to be nearly impossible. Russia continued to mobilize for war. However, everything changed when the British fleet approached the capital from the Sea of Marmara. The Sultan suspended (but did not abolish) the constitution and Midhat Pasha, its author, was exiled soon afterwards. Early in 1877 the Ottoman Empire went to war with the Russian Empire. Abdul Hamid's biggest fear, near dissolution, was coming to effect by the Russians declaration of war on April 24, 1877 and following Russian victory by February 1878. Abdul Hamid did not find any help. The chancellor Prince Gorchakov had effectively purchased Austrian neutrality with the Reichstadt Agreement, and the United Kingdom, though still fearing the Russian threat to British dominance in Southern Asia, did not involve herself in the conflict. The Treaty of San Stefano imposed harsh terms: the Ottoman Empire gave independence to Romania, Serbia, and Montenegro; to grant autonomy to Bulgaria; to institute reforms in Bosnia and Herzegovina; and to cede the Dobruja and parts of Armenia to Russia, which would also be paid an enormous indemnity. Abdul Hamid was the first to recognize and acknowledge the Aromanian nation in European Turkey with the Irade document, signed on May 23, 1905, which today is celebrated as the National Day of the Aromanians. As Russia could dominate the newly independent states, her influence in Southeastern Europe was greatly increased by the Treaty of San Stefano. Due to the insistence of the Great Powers (especially the United Kingdom), the treaty was later revised at the Congress of Berlin so as to reduce the great advantages acquired by Russia. In exchange of these favors, Cyprus was "rented" to Britain in 1878 while the British forces occupied Egypt and Sudan in 1882 with the pretext of "bringing order" to those provinces. Cyprus, Egypt, and Sudan remained as Ottoman provinces "on paper" until 1914, when Britain officially annexed those territories in response to the Ottoman participation in World War I at the side of the Central Powers. There was also trouble in Egypt, where a discredited khedive had to be deposed. 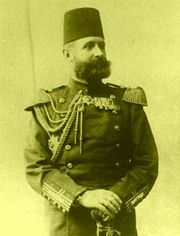 Abdülhamid mishandled relations with Urabi Pasha, and as a result Great Britain gained virtual control over Egypt by sending its troops with the pretext of "bringing order." There were problems on the Greek frontier and in Montenegro, where the European powers were determined that the decisions of the Berlin Congress should be carried into effect. The union in 1885 of Bulgaria with Eastern Rumelia was another blow. The creation of an independent and powerful Bulgaria was viewed as a serious threat to the Ottoman Empire. For many years Abdülhamid had to deal with Bulgaria in a way that did not antagonize either Russian or German wishes. Crete was granted extended privileges, but these did not satisfy the population, which sought unification with Greece. In early 1897 a Greek expedition sailed to Crete to overthrow Ottoman rule in the island. This act was followed by war, in which the Ottoman Empire defeated Greece (see the Greco-Turkish War (1897)). But a few months later Crete was taken over en depot by England, France, and Russia. Prince George of Greece was appointed as ruler and Crete was also lost to the Ottoman Empire . The Triple Entente—that is, the United Kingdom, France and Russia—maintained strained relations with the Ottoman Empire. Abdülhamid and his close advisors believed the empire should be treated as an equal player by these great powers. In the Sultan's view, the Ottoman Empire was a European empire, distinct for having more Muslims than Christians. Abul Hamid and his divan viewed themselves as modern, however their actions were often construed by Europeans as exotic or uncivilized (Deringil. 1998, 139-150). Abdülhamid now viewed the new German Empire as a possible friend of the empire. Kaiser Wilhelm II was twice hosted by Abdülhamid in Istanbul; first on October 21, 1889, and nine years later, on October 5, 1898 (Wilhelm II later visited Istanbul for a third time, on October 15, 1917, as a guest of Mehmed V). German officers (like Baron von der Goltz and von Ditfurth) were employed to oversee the reorganization of the Ottoman army. German government officials were brought in to reorganize the Ottoman government's finances. Abdülhamid tried to take more of the reins of power into his own hands, for he distrusted his ministers. Germany's friendship was not disinterested, and had to be fostered with railway and loan concessions. In 1899, a significant German desire, the Baghdad Railway, was given to them. This paved the way for the Empire's World War I alliance with Germany. Defeat in that war resulted in the dismantling of the empire. In July 21, 1905, Abdülhamid was subjected to an assassination attempt. Abdülhamid was regularly using only the mosque for Friday prayers. This routine gave Armenian separatists, in the command of Belgian anarchist Edward Jorris, Kristofor Mikaelyan which was the field responsible, Robina, Nishan Minasian, Migirdic Serkis Garibyan, Karabet Ohanesyan, Vahram Sabun Kendiryan, Silviyorici, Sari Torkom and Trase Yuvanovic the chance to place a clock operated bomb in a car with over 80 kg explosives with 20 kg iron pieces to act as shrapnel in front of the mosque. Two of the assassins, Kristofor Mikaelyan and his so-called daughter Robina, has observed Abdülhamid's routine for weeks. The distance between the point Sultan gets on his car and the first stairs of the mosque was walked about 1 minute 42 seconds, and the bomb was set according to this figure. In the day of the action, Abdülhamid started chatting with Seyhulislam Cemalettin Efendi, and was late to arrive to the explosion point. The bomb exploded at the right time, killing 26, wounding 58, and crushing 17 cars and 20 horses. Abdülhamid got away without a scratch. In the summer of 1908 the Young Turk revolution broke out and Abdülhamid, upon learning that the troops in Salonica were marching on Istanbul (July 23), at once capitulated. On the July 24, an irade announced the restoration of the suspended constitution of 1876; the next day, further irades abolished espionage and censorship, and ordered the release of political prisoners. On December 17, Abdülhamid opened the Turkish parliament with a speech from the throne in which he said that the first parliament had been "temporarily dissolved until the education of the people had been brought to a sufficiently high level by the extension of instruction throughout the empire." No significant educational reforms had taken place over the previous 30 years. The new attitude of the sultan did not save him from the suspicion of intriguing with the powerful reactionary elements in the state, a suspicion confirmed by his attitude towards the counter-revolution of April 13, 1909 known as 31 Mart Vakası, when an insurrection of the soldiers backed by a conservative public upheaval in the capital overthrew the cabinet. The government, restored by soldiers from Salonica, decided on Abdülhamid's deposition, and on April 27 his brother Reshad Efendi was proclaimed as Sultan Mehmed V.
The Sultan's countercoup, which had appealed to conservative Islamists in the context of the Young Turks' liberal reforms, resulted in the massacre of tens of thousands of Christians in Adana province. At his accession, some commentators were impressed by the fact that he rode practically unattended to the Eyüp Sultan Mosque where he was given the sword of Osman. Most people expected Abdülhamid II to have liberal ideas, and some conservatives were inclined to regard him with suspicion as a dangerous reformer. In the event, like many other would-be reformers of the Ottoman Empire, change proved to be nearly impossible. Default in the public funds, an empty treasury, the 1875 insurrection in Bosnia and Herzegovina, the war with Serbia and Montenegro and the feeling aroused throughout Europe by the cruelty used in stamping out the Bulgarian rebellion all proved good reasons not to undertake any significant changes. Financial embarrassments forced him to consent to a foreign control over the national debt. In a decree issued in December 1881, a large portion of the empire's revenues were handed over to the Public Debt Administration for the benefit of (mostly foreign) bondholders. Over the years Abdülhamid succeeded in reducing his ministers to the position of secretaries, and he concentrated much of the administration of the Empire into his own hands at Yıldız Palace. But internal dissension was not reduced. Crete was constantly in turmoil. The Greeks living within the Ottoman Empire's borders were dissatisfied, as were the Armenians. His distrust for the reformist admirals of the Ottoman navy (whom he suspected of plotting against him and trying to bring back the 1876 constitution) and his subsequent decision to lock the Ottoman fleet (which ranked as the third largest fleet in the world during the reign of his predecessor Abdülaziz) inside the Golden Horn caused the loss of Ottoman overseas territories and islands in North Africa, the Mediterranean Sea and the Aegean Sea during and after his reign. Abdülhamid recognized that the ideas Tanzimat could not bring the disparate peoples of the empire to common identity, such as Ottomanism. The Russia's pan-Slavism, pan-Hellennism, was stronger than Ottomanism, in the Ottoman Empire. Abdülhamid tried to hold on formulation of a new and more relevant ideological principle. Ottoman sultans beginning with 1571 were also Caliphs. He wanted to use this as a rallying point for Muslims in the empire, so he emphasized the Ottoman Caliphate. to have the scalpel cut my body is less painful than to witness Palestine being detached from the Khilafah state and this is not going to happen …let the Jews keep their millions and once the Khilafah is torn apart one day, then they can take Palestine without a price. Abdülhamid's appeals to Muslim sentiment were powerless against widespread disaffection within his Empire due to perennial misgovernment. In Mesopotamia and Yemen disturbance was endemic; nearer home, a semblance of loyalty was maintained in the army and among the Muslim population only by espionage, and by wholesale arrests. After his rule began, Abdülhamid became obsessed with the paranoia of being assassinated and withdrew himself into the fortified seclusion of the Yıldız Palace. Starting around 1890 the Armenians began clamoring to obtain the reforms which were promised at Berlin. Unrest occurred in 1892 and 1893 at Merzifon and Tokat. Armenian groups staged protests and were met by violence. Sultan Abdülhamid did not hesitate to put down these revolts with harsh methods, possibly to show the unshakable power of the monarch, and often used the local Muslims (in most cases the Kurds) against the Armenians. According to Turkish scholar Taner Akçam, Kaiser Wilhelm II of Germany claimed that 80,000 Armenians had been killed, and French reports claimed that 200,000 had been killed. In 1907, the Armenian Revolutionary Federation attempted to assassinate him. Surviving the assassination, he eased his orders of purges against the Armenians. The ex-sultan was conveyed into dignified captivity at Salonica. In 1912, when Salonica fell to Greece, he was returned to captivity in Istanbul. He spent his last days studying, carpentering and writing his memoirs in custody at Beylerbeyi Palace, where he died on February 10 1918, just a few months before his brother, the sultan. Abdülhamid was the last relatively autonomous sultan of the Ottoman Empire. He presided over thirty three years of decline. The Ottoman Empire had long been caricatured by the great powers as the "Sick Man of Europe." While its European neighbors were making railroads, automobiles, electric lights and even airplanes, the Ottoman Empire was unable to develop such advanced industry. The Ottoman subjects rarely saw the benefits of the attempted reforms carried out under the Sultan's reign. Within a few years of his death, the Ottoman Empire was in ruins, the republican modern nation state of Turkey was established and the caliphate abolished. In many respects, Abdülhamid's legacy was the prelude to the end of empire. Loss of the Balkan provinces, and of Cyprus in 1878, financial indebtedness to the European powers, while his choice of Germany as a friend proved fatal when the Axis Powers lost World War I. Although Abdülhamid tried to introduce reforms, they did not change life for most people in the empire and his autocratic tendency was out of sympathy with the mood of the time. In many Arab parts of the Empire, nationalist or pan-Arabist movements were underway that saw local self-governance and regional or national identity as more important than membership of a "caliphate" headed by a distant, non-Arab autocrat. He was unable to stem this development, although he tried hard to retain the loyalty of Hussein bin Ali, Sharif of Mecca by keeping him and his family for many in Istanbul but, forming the Arab Legion, they rebelled and aided the British in World War I.
Abdülhamid's era had seen an upsurge of political satire. Inside and outside the empire, Abdülhamid's cunning but harsh policies, or propaganda against Abdülhamid's activities, were reflected in many caricatures. Abdülhamid celebrates the Turkish victory at the Greco-Turkish War of 1897 and the addition of Thessaly to the Ottoman Empire by asking "who says Sick Man now?" ↑ Frank S. Nugent, Sidelights on Turkish History in 'Abdul the Damned' at the Rialto. The New York Times, May 11, 1936. Retrieved February 1, 2018. ↑ "Great Assassin," Says Gladstone; His Name for the Wretched Sultan of Turkey. The New York Times. Retrieved February 1, 2018. ↑ William Stearns Davis, A Short History of the Near East (New York, NY: Macmillan Co., 1922), 358. Retrieved February 1, 2018. ↑ Abdul's Heirs. Time Magazine, February 10, 1930. Retrieved February 1, 2018. ↑ James Creelman, The Slaughter of Christians in Asia Minor. The New York Times, August 22, 1909. Retrieved February 1, 2018. ↑ The summit of Sharm El-Sheikh is a vital stage in a series of humiliating concessions Hizb ut-Tahrir. Retrieved February 1, 2018. ↑ Taner Akçam, Paul Bessemer (trans. ), A Shameful Act: The Armenian Genocide and the Question of Turkish Responsibility (New York, NY: Metropolitan Books, 2006, ISBN 978-0805079326). 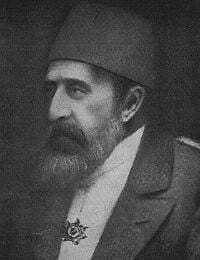 ↑ Abdul Hamid II Collection: Prints and Photographs. Library of Congress. Retrieved February 1, 2018. 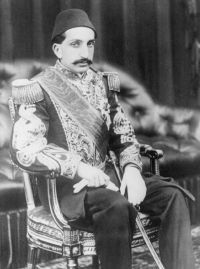 Abdul Hamid II Collection Library of Congress of photographs. History of "Abdul Hamid II"
This page was last modified on 21 January 2019, at 16:57.